Some of the accessories pictured below can be used with your LiftMaster, Chamberlain, Sears or Craftsman, Master Mechanic, Security + and Garage Master garage door openers or any other Chamberlain made garage door opener . The other accessories are Universal and can be used with any type of garage door or garage door opener. If you are still unsure please Contact Us. Works with all garage door opener systems. Provides buffer at motor mount to ceiling. Reduces vibration and noise to rooms above your garage. Liftmaster and Chamberlain Brand garage door openers manufactured after January 1, 1995. NEVER ENTER A DARK GARAGE AGAIN! Hands free operation with infrared sensor the detects motion in the garage and turns your garage door opener lights on automatically. Operates with both 390MHz and 315MHz. This item replaces the 982LM plug in light control. Liftmaster and Chamberlain Brand garage door openers. Turns inside house lights On or Off with your garage door opener remote control. Plug 995LM into any wall outlet, then plug light or appliance into control. Compatible with Liftmaster Keyless Entry 977LM. SECURITY+ openers 315MHz frequency ONLY. Plug 395LM into any wall outlet, then plug light or appliance into control. Compatible with all Liftmaster and Chamberlain brand garage door openers in a 315MHz frequency. Only works with Liftmaster Chamberlain Sears Craftsman garage door openers that are equipped with photo-eye safety sensors. Designed to help you park in the right spot every time. Works automatically. Pulsating beam turns on for 90 seconds when the sensor beam is interrupted. You pull in your car until the RED DOT from the laser hits a pre-targeted spot on your dash board. Up to two laser parking accessories may be installed with each LiftMaster garage door opener equipped with photo-eye safety sensors. Simple to Install. Connects to the photo-eye safety sensor terminals. Adjustable beam may be pointed in any direction. Laser guided accuracy. Class 2 laser is safe on the eyes, yet clearly visible. Includes wall and ceiling mounting kit and 7 feet of bell wire. For use with model 3800, 8500 Jackshaft residential opener. Allows the garage door openers to be lowered due to low ceilings or obstructed areas. Used when outlet is not available within 6 feet when installing 3800 or 8500 Jackshaft garage door opener. Puts power where you need it without the need of any Electrician. Includes transformer box, interface box, 35 feet of low-voltage wire and mounting hardware. 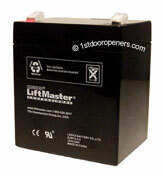 For use with the LiftMaster 3800, 8500 Jackshaft Garage Door Opener and Estate Series Models 2500, 2500B, 2500D & 3500. Always charged and ready, the EverCharge™ powers the garage door opener to open and close the garage door up to 20 full cycles when the power goes out. Audible signal sounds when door is moving under battery power. Bright LED lights let you know that the EverCharge™ is operable, when it is in use, or when the batteries need to be replaced. All safety and security features still operate. Simple to install. It sits on top of and plugs right into the back the opener. For low headroom installations, the EverCharge™ can also be mounted to a joist/rafter on the ceiling. Same as part number 41A6357-1. Always charged and ready, the EverCharge™ powers the garage door up to 20 full cycles when the power goes out. LiftMaster, Chamberlain, Sears Craftsman, and Chamberlain brand garage door opener safety sensor sun shields. These safety sensor sun shields are used to prevent sunlight from shining into sensor causing accidental reversal of garage door. ONLY compatible with new style snappy brackets 41A5266-1. Yearly application, prolongs the life of the worm and drive gears in chain drive openers. Also provides smooth and quiet operation on screw drive openers. Ideal for all metal moving parts on garage doors. Rated for once a year application. 8oz. can. Recommended lubricant to ensure smooth travel of trolley on t-rail or square rail assemblies. Used in "Vault" type situations when garage does not have service entry door. Used in low clearance opener or garage door installations. Replaces existing top roller brackets on your garage door. Comes with 2 brackets and 4 rollers. Provides secure bracket connection to any door. Adjustable. May be used on 18" to 24" wide sections. Perfect for protecting your garage door opener and other small appliances in your home. Allows access to garage using key. For use with wall buttons, safety sensors and K-1 keylock. Used for mounting wall button, safety sensors and K-1 keylock wiring. Takes the guess work out of parking your car. Mounts from ceiling to ensure perfect stop every time. Optex now brings the benefits of its advanced wireless technology in the form of greater RF transmission range and design versatility, to make you life more comfortable and convenient. The Wireless 1000 Annunciator System can be installed anywhere easily and quickly with no wiring. Whether it is for the home or business, indoor or outdoor, Wireless 1000 is the ideal choice for perimeter awareness and wireless remote control. NO MORE SURPRISES!!! The Wireless 1000 monitors your property 24 hours a day to detect approaching vehicles and people, giving you time to prepare. NO MORE MISSED VISITORS OR DELIVERIES!!! The Wireless 1000 serves as a welcome chime or perimeter alert for your home, shop, or store. NO MORE HARD TO REACH SWITCHES!!! The Wireless 1000 works as a convenient wireless switch for activating a variety of electrical equipment (e.g. door strikes, magnetic locks, lights, sirens, motors). EASY TO INSTALL! NO WIRING REQUIRED! Maximum transmission range - 1000 feet (open field, line of sight). Natural or man-made obstacles can interfere or reduce transmission range. FCC approved. 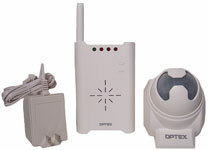 To see additional parts for Optex click here.